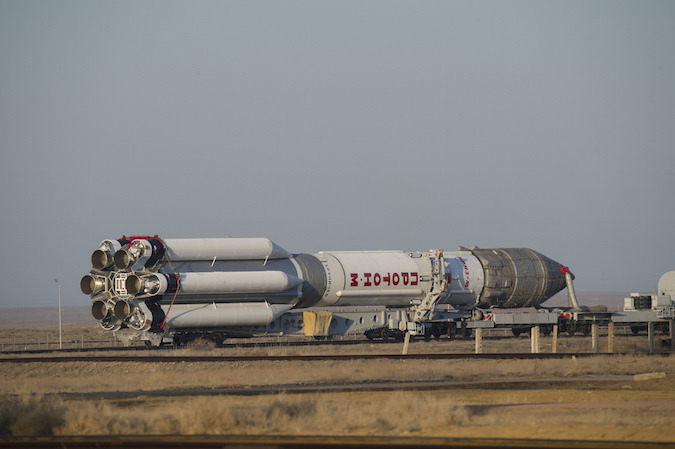 The engine problems will keep Proton flights grounded for a few more months, and perhaps until June, meaning the rocket could go a year between missions. The last Proton rocket lifted off June 9, 2016, with the Intelsat 31 communications satellite. Russian officials postponed subsequent launches to investigate the premature shutdown of the Proton’s second stage on the Intelsat mission. The third stage and Breeze M upper stage had enough fuel to overcome the second stage shortfall, deploying Intelsat 31 into its intended orbit. The inquiry into the second stage anomaly pushed back the launch of the EchoStar 21 satellite, a spacecraft to support mobile communications in Europe, to the end of 2016. Russian news reports last month said officials were addressing defects discovered in heat-resistant metals used in the Proton’s second and third stage engines, requiring the engines to be shipped from the Baikonur Cosmodrome in Kazakhstan and the Proton rocket’s Khrunichev factory near Moscow back to their production site — the Voronezh Mechanical Plant, or VMZ, in southern Russia — for disassembly. Russia’s Kommersant newspaper reported the alloys typically used in the RD-0210 and RD-0212 second and third stage engines were replaced with less expensive metals. Dmitry Rogozin, Russia’s deputy prime minister whose portfolio includes the space industry, posted on Twitter on Jan. 28 that the faulty second and third stage engines would be replaced. In a series of tweets, Rogozin also thanked Khrunichev — the Proton rocket’s prime contractor — for finding the engine problems, and announced that officials from NPO Energomash — a rival Russian engine-builder — would “clean up the mess” at VMZ. He tweeted that three Proton rockets would be dismantled, and said those responsible for the unauthorized use of substandard alloys will be punished. The Proton rocket’s second stage is powered by three RD-0210 engines and a single RD-0211 engine. An RD-0212 propulsion system is mounted on the aft end of the Proton’s third stage. All of the Proton rocket’s powerplants burn hydrazine fuel and nitrogen tetroxide oxidizer, a hypergolic mixture that combusts on contact with each other. According to a story published by Russia’s Tass news agency, Rogozin blamed the “criminal negligence” on a weak culture of production and low wages at the VMZ factory. Rogozin tweeted Jan. 30 that the engine replacements could halt the Proton launch manifest for another three-and-a-half months. 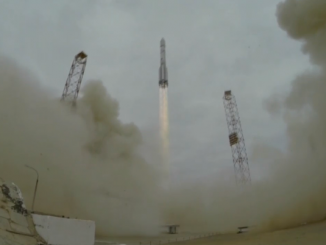 But Russian space agency chief Igor Komarov told the Russia 24 television network Friday that Proton launches could resume as soon as early April. First up when Proton rockets are approved for flight will be the EchoStar 21 satellite on a commercial mission managed by International Launch Services, a Virginia-based firm owned by Khrunichev responsible for securing Proton launch contracts on the global market. EchoStar 21 was transported from its Space Systems/Loral plant in California to the Proton launch base in Kazakhstan in November for a planned liftoff in December. 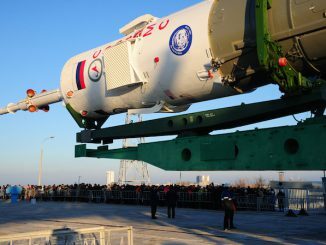 The spacecraft is in storage at the Baikonur Cosmodrome until officials clear launch preparations to proceed. Russia’s Soyuz rocket has also not launched — with the exception of a successful commercial flight by Arianespace on Jan. 27 — since a launch failure Dec. 1 destroyed a robotic Progress supply ship on the way to the International Space Station. The Dec. 1 failure occurred during the firing of the Soyuz third stage’s kerosene-fueled RD-0110 engine, which is also produced at the VMZ factory, although news reports did not identify the Soyuz problem as related to the Proton engine woes. The Russian space agency, Roscosmos, last month published a summary of the findings made by engineers probing the Dec. 1 launch failure. The sudden mishap occurred when the Soyuz third stage and the Progress MS-04 cargo craft had an “off-nominal separation,” Roscosmos reported, after the rupture of the third stage’s liquid oxygen tank and a fire inside the stage’s RD-0110 engine oxidizer pump. The oxidizer pump fire could have been caused by the introduction of foreign object debris into the pump cavity, or a violation of engine assembly procedures, Roscosmos said. Citing a statement from the Roscosmos press office, Tass reported last month that that the RD-0110 third stage engines on the next two Soyuz launches in support of the space station will be replaced. 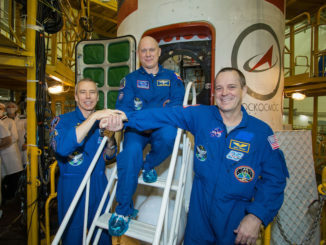 Technicians were expected to install similar RD-0110 engines from different manufacturing lots on the Soyuz-U and Soyuz-FG boosters slated to launch the Progress MS-05 cargo mission Feb. 22 and the Soyuz MS-04 spaceship with two astronauts on-board in March or April. The Proton rocket launched three times last year — all successfully — giving the booster its lowest annual flight rate since the 1970s.